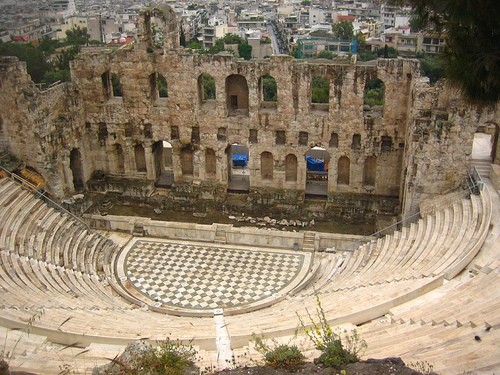 GREEK THEATRE in Athens began some 2,500 years ago – around 600 BC – but its form, technique and terminology have lasted into modern theatre. 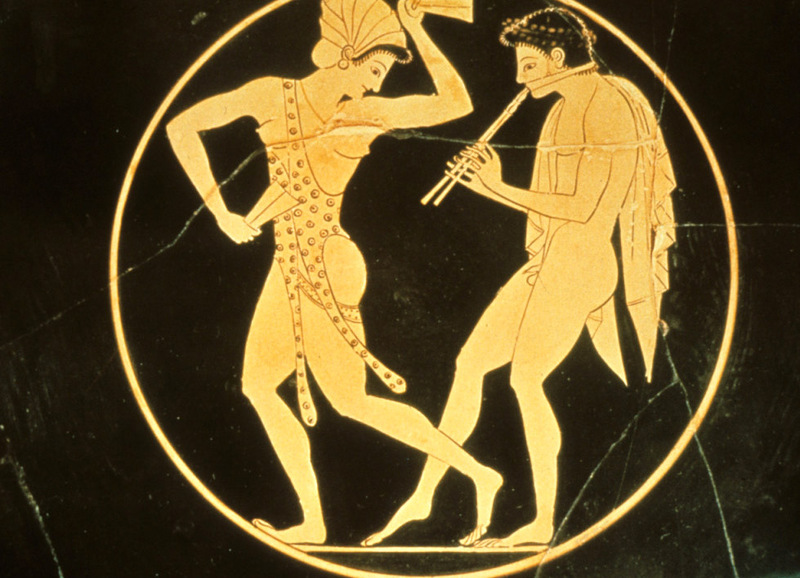 Greek festivals evolved from religious rites going back to about 1200 BC when the cult of Dionysus led to somewhat emotional displays of dancing (those of you who were part of the 60s/70s era will know what I mean). 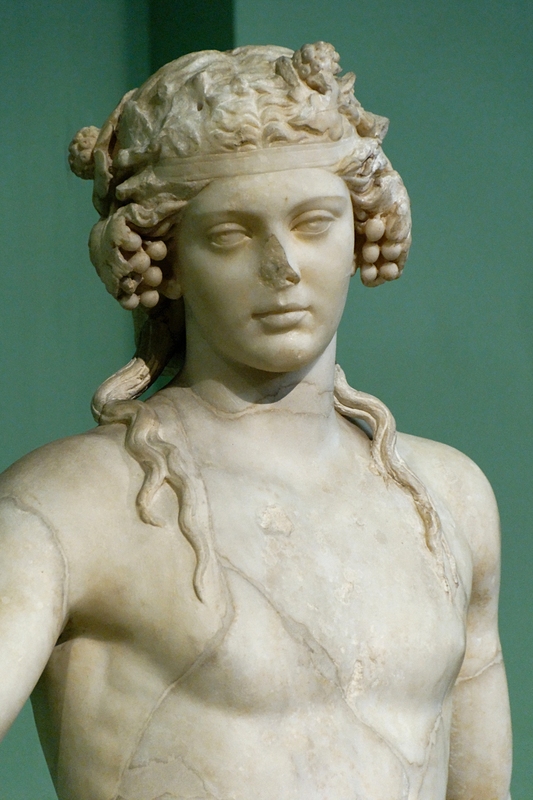 Dionysus was the son of Zeus and Semele and so was one of the 12 Olympian gods (he was god of wine, fertility, grapes, ecstasy, madness, pleasure, festivity, etc – you get the drift). Initially the rites of Dionysus were led by the dithyramb (‘choric hymn’). This was sung/chanted by a Greek chorus of up to fifty men or boys (no women or girls in ancient Greek theatre). They may have been dressed as satyrs (men with horses’ ears and tail, servants of Dionysus) and some probably played the flute, lyre and drums. The gist of the hymn would relate to some incident in the life of Dionysus or just be celebrating wine and fertility in his name. Good a reason as any. Circa 600 BC, Arion of Mehtymna (Corinth) wrote down formal lyrics for the dithyramb. Then, sometime during the next 75 years, Thespis of Attica added an actor who interacted with the audience. And that is where the word thespians (actors) today comes from. 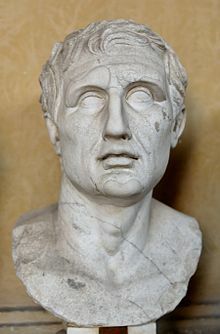 This actor was known at the protagonist, meaning the main character of a drama. In 534 BC, Pisistratus (the Athenian ‘tyrant’) changed the Dionysus festivals and introduced drama competitions. 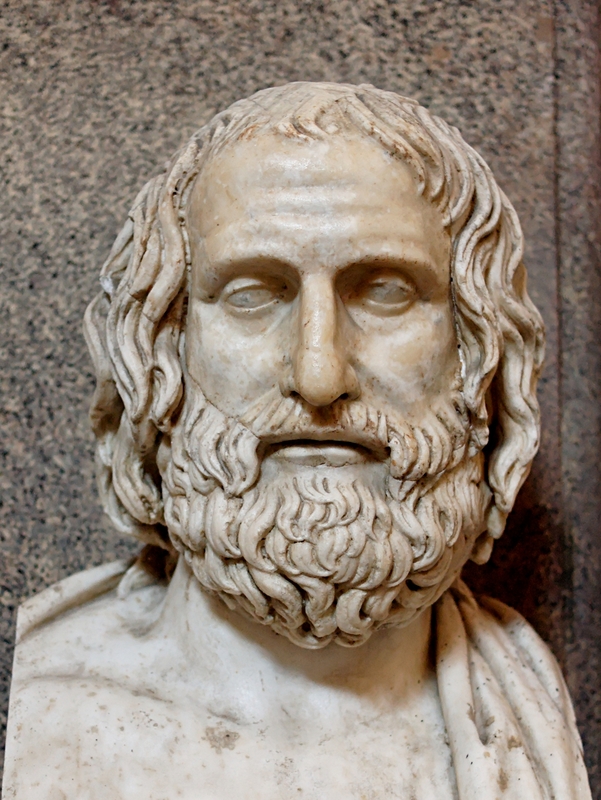 Thespis is said to have won the first competition. 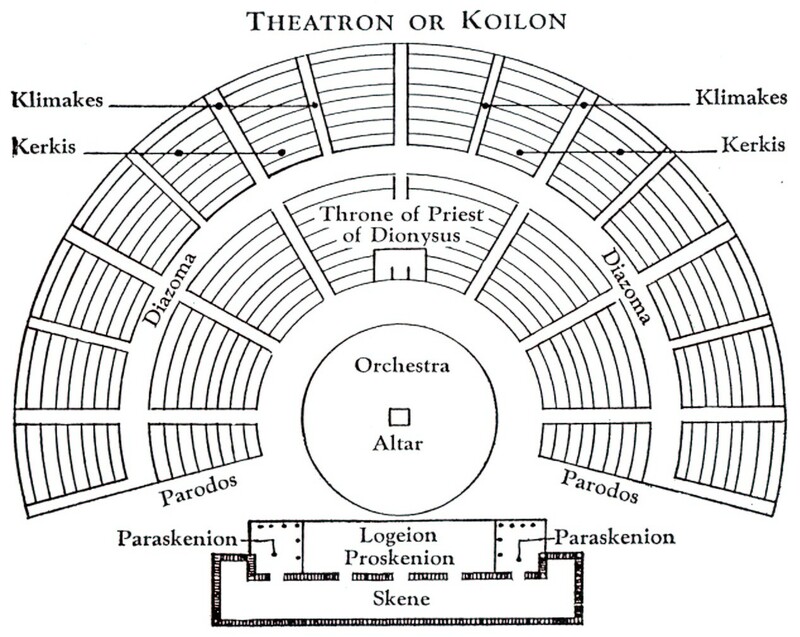 Around this time the Theatre of Dionysus was built in Athens (what remains today is mainly from the 4th century BC). 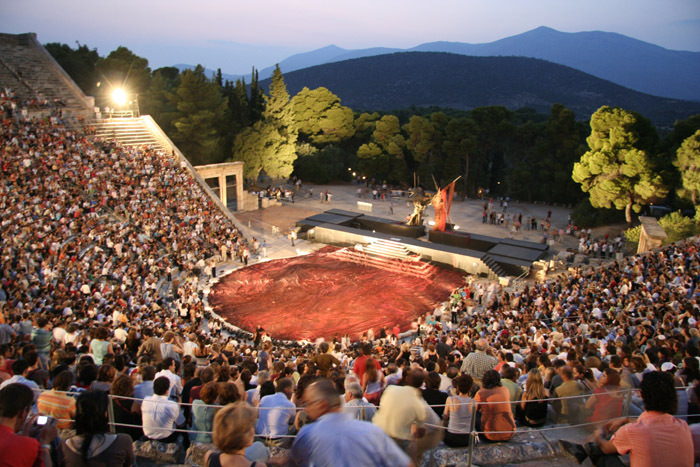 The Theatre at Epidaurus, in the east Peloponnese of Greece, is still used today for Greek plays (but not always in Greek – Sarah I went there a few years ago when four Greek plays were presented in German and to a modern setting – it just didn’t work for either of us). The theatre was designed by Polykleitos the Younger in the 4th century BC and originally had 34 rows of seats which were extended at the top to another 21 rows by the Romans. The view of a lush landscape behind the skene was an integral part of the theatre itself and not to be obscured. Plays were performed in the daytime and were spread over several days in Athens. There was little or no scenery and most the action took place in the orchestra by the ‘chorus’. When there came an important shift from chorus to characters, the action moved to the skene (then became ‘the stage’). The chorus literally means ‘dance’ and most Greek choruses blended music, dance and song. The chorus entered the orchestra during the parados (‘entrance speech’) and remained there for the whole play. Its purpose was to create ‘doom and gloom’ to come (‘foreshadowing’) and some suspense to help the audience understand what was happening (although with the later tragedies, the audiences already knew the plots). Tragedy (Tragodia) comes from tragos and ode meaning ‘goat song’. The reason the word is used is obscure but it could either mean that the chorus was dressed in goat skins, or a goat was the prize for the best song/play (hmmmm …. ok). Tragedies, usually trilogies, were centred around the rise and downfall of the ‘hero’ (from Homeric epic or mythology) and the conclusion was usually a messenger coming out to tell the audience of the tragic consequences of the characters action (never good). 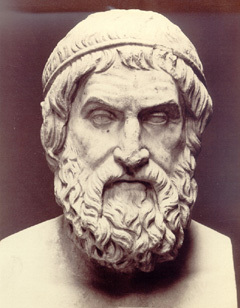 The main tragedy poets of the 5th century BC were Aeschylus (who added a second actor, the antagonist, and reduced the chorus from 50 to 12); Sophocles (who added a third actor and put more emphasis on interaction between humans rather than humans and gods); and Euripides (whose plays were more about real people). Due to the limited number of main actors, masks were worn by all at all times (that way one or two actors could play different parts – also, masks may have amplified the voice). Satyr had to be submitted to a magistrate (archon eponymos) along with three tragedies for a competition. 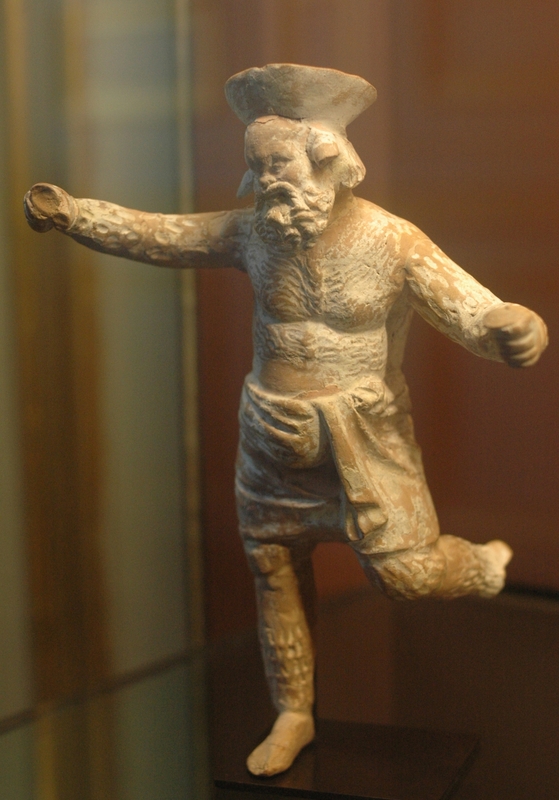 A satyr play, although implies comedy, was actually somewhere between tragedy and comedy – sort of tragicomedy – and, again, taken from epic or mythology. The only satyr play to survive in its entirety is Euripides’ Cyclops based on Odysseus’ encounter with the cyclops, Polyphemus (not exactly an hysterical tale). They were performed at the end or between the 2nd and 3rd Tragedy play for a bit of ‘light’ relief. You needed a break! Comedy was slapstick and crude humour and appeared for the Festival of Lenaia in March. Such plays had happy endings and the characters usually found a solution to the original conflict of the play (rather like farce). 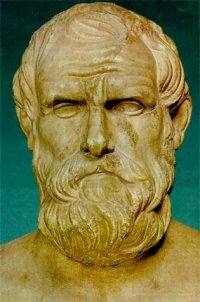 Aristophanes (old satirical comedy) and Menander (new farcical comedy) were the best known comic playwrights of the 5th-4th centuries BC. The democracy of Athens allowed for free speech and these guys made good use of that. 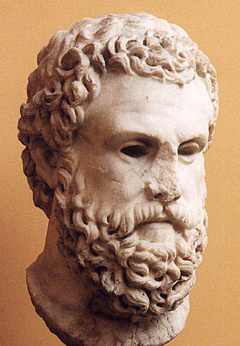 Aristophanes particularly disliked warmongers and made that clear in his plays (occasionally finding himself in court for defamatory remarks against a pro-war fanatic called Cleon). Athenian drama waned somewhat around 404 BC with the defeat of the Athenians by the Spartans at the end of the Peloponnesian War. Athens was never the same again. In fact, nor was drama …….. until a chap called Shakespeare came along some two thousand years later in the 17th century. So there you have it. Don’t you feel better informed? ……… No. Okay. ← 300 [Spartans]: Hollywood fact or fiction?